Using System.JS and Webpack to load scripts and their dependencies. Developing highly performance server-side applications to run within Node Js. Reviewing high performant Node.js patterns and manage garbage collection. Scale and performance lie at the heart of the projects built in our book. The lessons learned throughout this book will arm you with everything you need to build amazing projects. During the course of this book, you will learn how to build a complete Single Page Application with Angular 2 and create a popular mobile app using NativeScript. 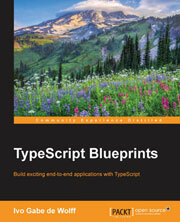 By the end of the book, you will have created a number of exciting projects and will be competent using TypeScript for your live projects. The book focuses on building projects from scratch. These end-to-end projects will give you ready-to-implement solutions for your business scenario, showcasing the depth and robustness of TypeScript.